Chris Auth currently holds his USSF National “D” License. Chris grew up playing soccer on Long Island, NY. Played club for Baymen SC 89′. 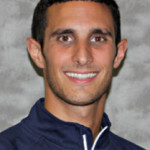 Chris played varsity soccer all four years of high school and continued his career at The College of Brockport where he won a SUNYAC Championship and appeared in the 2009 and 2010 NCAA DIII National Tournament with the Golden Eagles. Chris has been coaching with Americas Futbol Club since 2011.